Learn how to get hundreds of dollars worth of Free Office Supplies from OfficeMax, Office Depot and Staples over and over again all year! I have been getting them for awhile now, and below I will tell you how to get them as well. It does take an initial investment, but then, if you work it correctly (as I describe below), you keep using the Reward Cards, Store Coupons and Checks to pay for most future purchases. Occasionally, you may have to chip in $1.00 to $4.00 in overage or taxes. And even if you don't need or use all of the freebies, you can sell what you don't use and earn extra income from it! Need to know how to do that? Check out my section, titled "Show Me Ways to Earn Extra Money" under "Selling Your Stuff." 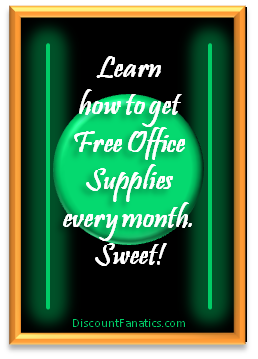 So, get started and you'll have a stockpile of free office supplies in no time! Also, be sure to turn in your used Ink/Toner cartridges for recycling. Don’t just throw them in the trash! These Office Supply Stores pay you for empty cartridges. Based on which store you turn it into; you’ll receive $2.00 to $6.00 each in your Rewards Account to be used toward Free Office Supplies! I’ve listed how much each store offers for cartridges below. Be certain to keep track of the expiration dates of your Rewards and use your Rewards before they expire, whether there’s a 100% Free Office Supplies Sale or not! Staples tends to offer free office supplies such as: Legal Pads, Plastic File Totes, Binders, Markers, Highlighters, Pens, Bankers Storage Boxes, Copy Paper, Envelopes, and more. Staples also has a price-match guarantee! •	Sign-up for the Staples Rewards account and you’ll start receiving emailed coupons, mailed coupons and catalogs containing coupons. • Before shopping at Staples, either in-store or online, always check their coupon page for coupon discounts that you may be able to use on your purchases. •	Check the paper or website weekly for Specials marked “Get 100% back in Staples Rewards”, and ONLY purchase these items in the limits listed (sometimes it will say, e.g., “limit 1 of each item per customer. Valid in store only.”). •	Then, keep buying ONLY (very important) products marked “Get 100% back in Rewards” in addition to using Staples Coupons and paying for subsequent orders with your Rewards Certificate (before it expires)! Whether you want/need these products or not, if you have money available on your Staples Rewards Certificate, why not get them. You can keep them, sell them, or give them away as gifts. That’s what I do! •	If the offer is available online, don’t forget to shop through one of the “Cash Back Shopping” sites that I’ve told you about to also earn a percentage of your purchase back! •	This program is for Individuals, Businesses and Teachers. •	Program offers 10% back in Rewards on all ink/toner purchases, case and ream paper, and copy and print purchases. •	Make sure you enter your Staples Rewards Account # during the online checkout process, and in-store, provide the cashier with your associated phone number! •	Visit their website for Full Program Details. Rewards are issued monthly when the balance is at least $10. Balances under $10 roll over each month until the minimums are met for that calendar quarter. If the $10 minimum for the quarter has not been met, the balance will expire at the end of the quarter. You’ll earn 10% back in Rewards on your ink and toner purchases. Also, turn in your used ink/toner cartridges for $2.00 each in Staples Rewards, up to 10 per month (or $20.00), per member. You must bring them into the store. Every now and again, Staples offers $3, $4 or even $6 for each empty cartridge! Look for these specials and try to turn in your cartridges during these times if possible! - make sure you're signed up for their emails. OfficeDepot use to offer freebies regularly, but now they only offer them occasionally. When the offers come around, they tend to offer free office supplies such as: Legal Pads, Manila File Folders, Binders, Highlighters, Pens/Pencils, Bankers Storage Boxes, Copy Paper, Envelopes, Address Labels, Batteries, Plastic Storage Totes and more. •	Sign-up for the Rewards account and you’ll start receiving emailed coupons, mailed coupons and catalogs containing coupons. •	Check the website weekly (sometimes these specials are not in the paper) for Specials marked “Get 100% back in Rewards”, and ONLY purchase these items in the limits listed (sometimes it will say, e.g., “limit 2 of each item per member per day”). •	Make sure your order totals over $50 to get the free shipping if you’re ordering online/over-the-phone. But, better yet, make sure your order totals over $75, use a ‘Get $25 off a $75 purchase Coupon’, and get $25 more worth of free products! Note: If you can’t find a coupon or coupon code, purchase one off of eBay for less than $1 – It’s worth $1 to save $24.00! •	Then, keep buying ONLY (very important) products marked “Get 100% back in Rewards” in addition to using Office Depot Coupons/Coupon Codes and paying for subsequent orders with your Rewards Card (before it expires), and you will continue to get Free Office Supplies! Whether you want/need these products or not, if you have money available in your Office Depot Worklife account, why not get them. You can keep them, sell them, or give them away as gifts. That’s what I do! •	If you shop online, don’t forget to shop through one of the “Cash Back Shopping” sites that I’ve told you about to also earn a percentage of your purchase back! •	This program is for Individuals and Businesses. •	Make certain that you enter your Worklife Rewards Member # during the online checkout process, or tell the cashier that you're a member! •	Rewards carry over from quarter to quarter for an entire calendar year. •	They pay 10% back in Rewards on Ink, Toner, Paper and Copy, Print and Ship Services from Copy & Print Depot, plus 1% back on almost everything else. When you earn $10 or more during a Rewards period your Reward Card will post to your online account within 30 days after the end of the quarter. Rewards are issued quarterly in Feb, May, Aug, Nov between the 15-31st. You’ll earn 10% back in Rewards on your ink and toner purchases. Also, turn in your used ink/toner cartridges for $2.00 each Recycling Rewards, up to 20 per month (or $40.00), per member. Limited to visibly undamaged ink or toner cartridges – you must bring into the store. OfficeMax tends to offer free office supplies such as: Legal Pads, Manila File Folders, Binders, Markers, Highlighters, Pens, Bankers Storage Boxes, Copy Paper, Envelopes, Address Labels and more. •	Sign-up for the MaxPerks account and you’ll start receiving emailed coupons, mailed coupons and catalogs containing coupons. •	Check the website weekly (sometimes these specials are not in the paper) for Specials marked “Earn 100% in MaxPerks Bonus Rewards”, and ONLY purchase these items in the limits listed (sometimes it will say, e.g., “limit 3 each”). •	No need to make more than an initial investment of more than $75 to $100 with OfficeMax. Make sure your order totals over $50 to get the free shipping if you’re ordering online/over-the-phone. But, better yet, make sure your order totals over $75, use a ‘Get $25 off a $75 purchase Coupon’, and get $25 more worth of free products! Note: If you can’t find a coupon or coupon code, purchase one off of eBay for less than $1 – It’s worth $1 to save $24.00! •	Then, keep buying ONLY (very important) products marked “Earn 100% in MaxPerks Bonus Rewards” in addition to using OfficeMax Coupons/Coupon Codes and paying for subsequent orders with your Rewards Certificates (before they expire), and you will continue to get Free Office Supplies! Whether you want/need these products or not, if you have money available in your MaxPerks account, why not get them. You can keep them, sell them, or give them away as gifts. That’s what I do! •	Note: They only let you use one Gift/Reward Card per online order, and three(3) Rewards Cards during any one in-store purchase. •	This program is for Businesses and Teachers. Even if you sell products on eBay or Etsy under a Business name; have a website; an online Store; etc., you can sign up. •	Make certain that you enter your MaxPerks ID number during the checkout process! •	You have 90 days from the date your Rewards are issued to use them before they expire, except in Florida where you have one(1) year from the date of issuance. •	You will earn a $25 reward in your MaxPerks account for every $500 of qualified purchases between each calendar period of 1/1 to 12/31. Rewards are issued around the 20th of the following month. You can check your account balance and print your Reward Certificates online. Turn in your used ink/toner cartridges for $3.00 each in MaxPerks Rewards, up to 20 per month (or $60.00), per member. Limited to visibly undamaged HP, Dell or Lexmark ink or toner cartridges – you must bring into the store. Offer excludes HP02, HP11, & HP88 series and any remanufactured cartridges. 1. Purchasing through a Cash Back Shopping site (like Ebates, etc.) if you purchase online. 2. Using a Store Coupon/Coupon Code (for $5 or more off) whether you purchase online or in-store. 3. Purchasing more than $50 worth (preferably $75 w/a $25-off coupon – so you get $25 more worth of free ink) to get Free Shipping if you’re ordering online. 4. Purchasing your Ink Cartridges in multi-paks instead of singles to save additional (per unit) pricing. 5. Purchasing in-store (preferably) so that you can turn in your used cartridges for the recycling credit. As I teach here at DiscountFanatics, when you combine strategies, YOU SAVE BIG!!! When your Printer says that your ink cartridge is empty, it's really not completely empty. You can still get many prints from that cartridge, simply by removing it and shaking it, then reinserting it. Yep! Also, don't simply remove the cartridge because it tells you it's low. I've received an additional 100 black copies after the cartridge has told me to change it that looked great. Change it only when you see the copies turning light.